If you follow me on Twitter, you know that despite the fact I rarely talk about cooking on the blog that I actually cook a great deal or rather as time allows. I am not a very crafty person; I can’t sew, knit, crochet or make anything other than meals and kids. Oh, I am rather good at running non-profits and turning them into financially solvent organizations. But how many folks really want to read a blog about how to make a struggling non-profit organization not only financially stable but to see it actually grow? Yeah I thought so. Anyway in recent weeks I have had several twitter followers ask me for some of my recipes, even real life friends have asked for a few recipes. 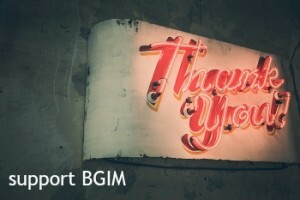 So as I struggle yet again with direction for this blog, I figured I would institute a new feature called cooking with BGIM. Like many who read my blog, I work outside of the home, so as much as I like to make everything from scratch the reality is that it’s impossible for me to do that every day. However I grew up with Sunday dinners, that one huge meal of the week where my mother cooked the equivalent of a Thanksgiving dinner every Sunday and often we had friends and family over to share the meal with us. When the Spousal Unit and I moved to Maine, for a brief period of time I attempted to have my own version of the Sunday dinner but as we had no family or friends to invite over when we first moved here, a huge spread for only the three of us (kidlet was not around at that time so it was me, the Spousal Unit and college boy who at that time would have been called only kid) simply made no sense. I attempted to re-start the Sunday dinner tradition when my Mom died but at that point it was simply too painful and until recently Sunday dinner was just like any other night. However the kidlet is growing up and with my father’s impending move to Maine, Sunday dinners have made a come back. I have very little family and while my son was blessed to have direct connections to my family, the kidlet has none and the act of the Sunday dinner is a way to share one of the many traditions I grew up with her, to connect her with the ancestors so to speak. So without further adieu here are a couple of items I have made recently. Last night we had lasagna, tossed green salad with local produce and Italian bread and for dessert pumpkin chocolate chip cookies. 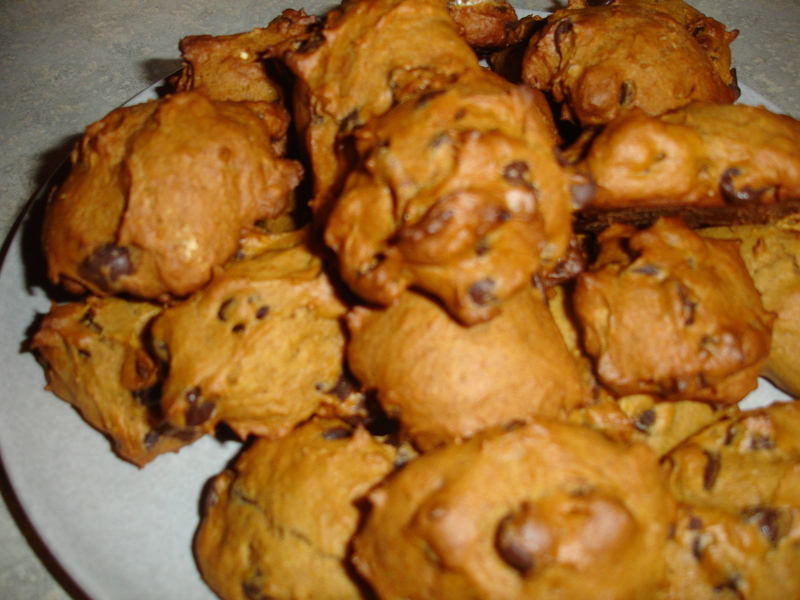 These cookies were delish though my attempt at using fresh pumpkin was a bust; in the end I used canned pumpkin puree. My fresh pumpkin adventures are another post…let’s just say I applaud folks who take whole pumpkins and turn them into something edible. It’s easier to make bread in my humble opinion than to make a pumpkin edible. 1. Combine pumpkin, sugar, oil and egg together. In a separate bowl stir together flour, baking powder, cinnamon and salt. 2. Dissolve baking soda w/milk and stir into pumpkin mixture. Now add flour mixture to pumpkin mixture and mix well. 3. Add vanilla and chocolate chips, mix well. 4. Drop by spoonful onto a greased cookie sheet and bake for 10 mins or until lightly brown and firm. Note: These are soft cookies, also due to a wonky old stove I baked for closer to 15 mins. 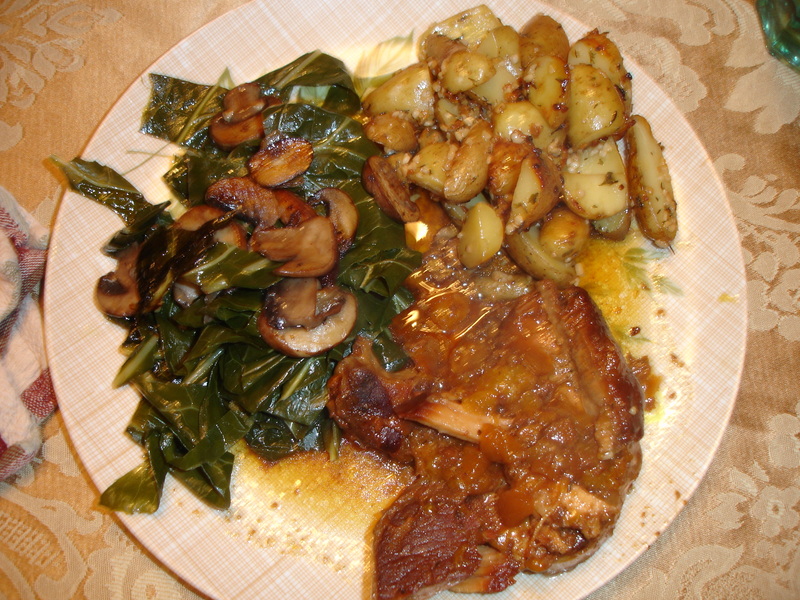 A few Sunday’s ago I made apricot orange pork chops with roasted fingerling potatoes and sautéed collards with mushrooms and onions. This meal sounds a lot fancier than it is as far as prep time in part because the chops are cooked in the Crockpot. A Crockpot is a lazy cook’s best friend, seriously in winter mine is used at least 2-3 times a week. Mix all ingredients well in a bowl, put the chops in the Crockpot, pour mixture over chops and cook 8 hours on low or 4 hours on high in the Crockpot. They are done when the meat is fork tender. Note: Neither of these recipes are my creations, sadly I cannot remember where I got them so can’t give proper credit but did want to let ya’ll know that. As a cook, who has been cooking a while I will admit I often take recipes and tweak them to my own taste buds but generally the first time out I will follow a recipe as it’s written unless there is an obvious issue. Happy Eating!